As consumption of media has moved increasingly towards a digital model and social networks have become more culturally relevant, the relationship between libraries and their patrons has been redefined; the expectations for how media is located and accessed – and what types of information are readily available – has become progressively more sophisticated. It was in this changing landscape that the Portland Public Library undertook a partnership with VONT to overhaul their online presence. 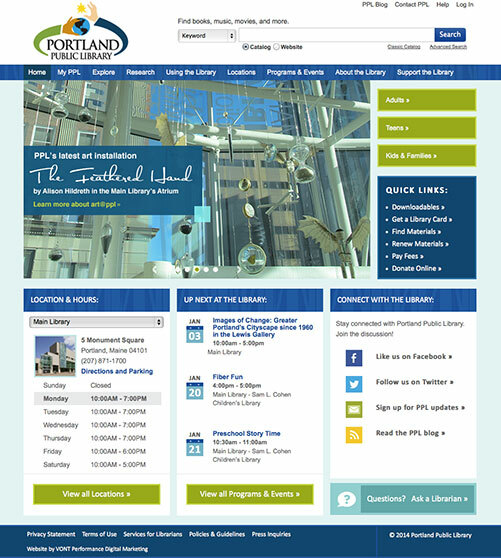 The Portland Public Library wanted a website that would not only showcase all the Library has to offer — from informational databases and books, music and movies to gallery shows and topical lectures — but would be user-friendly for an audience ranging from toddlers through seniors. With so many different reasons that a person would visit the site, the goal was to allow them easy access to what they intend, and for them to be delighted by what they find. In addition, the new site would need to integrate seamlessly with existing systems, while providing easy-to-use content tools for internal content management amongst a wide variety of staff. VONT took a user-centric approach to the project, beginning with a user research phase to define the needs, expectations, and behaviors of the Library’s audience. A systems discovery process was begun as well, establishing functions and integration opportunities for each system the Library relies on. The information generated through this phase was used as the foundation to create a modern information architecture for the Library’s site, that provides clear paths for patrons to locate materials, incorporates social platforms, and highlights the Library’s role as a cultural institution. In addition, a powerful, integrated content management approach was developed that would allow for website content to be grouped dynamically based on facets like user interest or demographic, enabling users to interact with Library content in a highly tailored fashion. Wireframes were transformed into realized designs, then into a fully functional beta site. Usability, ADA compliance, and system load tests were conducted, and the beta site was refined in preparation for launch. 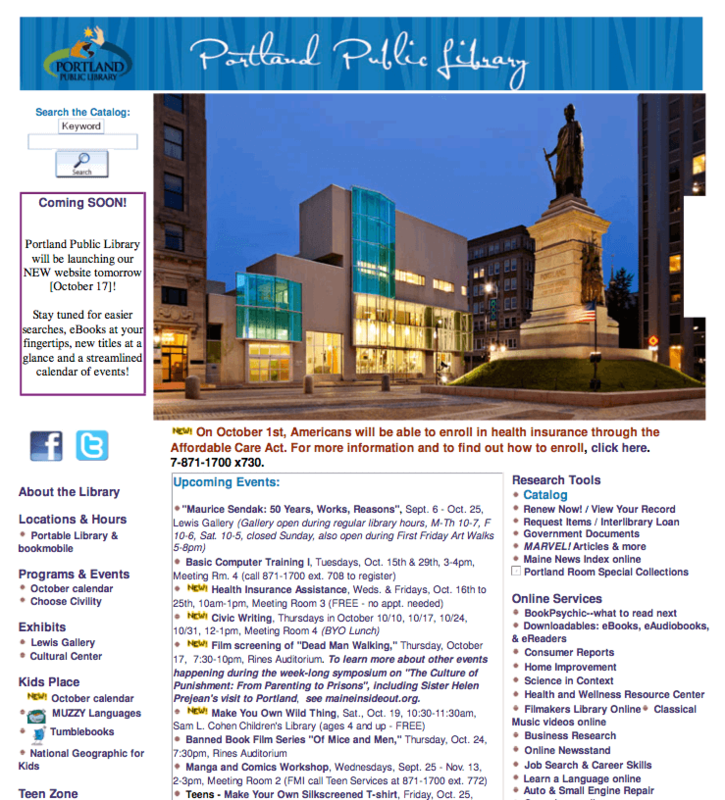 Portland Public Library home page before and after. Vastly improved engagement metrics illustrate the success of the clean new website. The site launched in October 2013 to positive feedback from Library personnel, patrons, and colleagues regarding look & feel, functional integration, and easy-of-use. Analytics from the same period pre-and post-launch indicate significant holistic engagement gains: 245% improvement in pages per visit, a 125% increase in visit duration, and a 14% reduction in bounce rate. Traffic to key functions – access to catalog, digital materials, research-related tools, program & event calendars – has increased significantly, with associated reductions in bounce and exit rates.